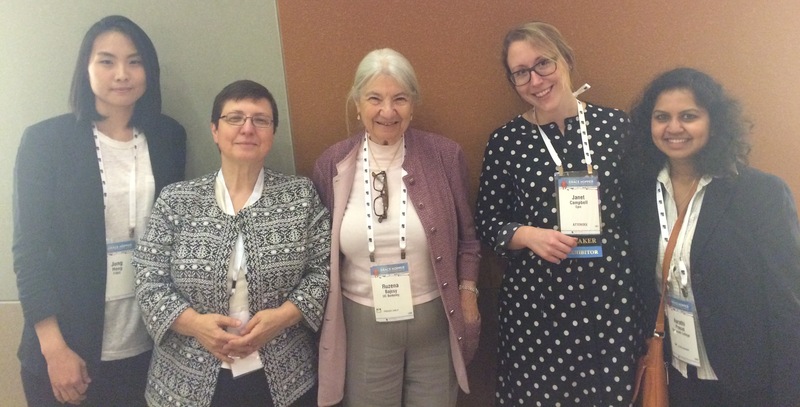 Two THaW researchers led a panel on designing mobile and wearable devices for health and wellness at the Grace Hopper Conference in Phoenix, Arizona on October 10th, 2014. The panel was co-hosted by Dr. Klara Nahrstedt (THaW Co-PI and Professor of Computer Science at UIUC), and Aarathi Prasad (Ph.D. Candidate at Dartmouth College). Panelists included Ruzena Bajcsy (Professor of EECS at UC Berkeley), Jung Ook Hong (research scientist at Fitbit), and Janet Campbell (product lead at Epic). The panel discussed issues related to usability, security, and privacy that mobile and wearable health and wellness application developers should be aware of. Jung discussed the effect that data presentation has on user’s behavior; for example, users are more likely to take 10,000 steps than 8,000 steps because they receive an encouraging message to take a few more steps to cross the daily 10,000 step-count goal. Ruzena talked about the challenges faced by elderly users of mHealth technologies, such as small fonts and complicated buttons on a device. Klara presented the security and privacy issues that arise when people use mobile and wearable health and wellness devices and discussed the different THaW projects briefly. Finally, Janet talked about the issues of sending data to an EHR, such as identifying the patient whose data is in the EHR. This entry was posted in Project news and tagged Grace Hopper Conference, mHealth, Panel Discussion by David Kotz. Bookmark the permalink.